Atlassian introduced a new app category "Data Center approved apps" and we're updating you what's special about it. One of the big announcements at Atlassian Summit in Barcelona in September was the introduction of a new category for apps on the Atlassian Marketplace: “Data Center approved apps”. This category supersedes the Data Center tag, which previously labeled apps compatible with the clustering and high-availability capabilities of Atlassian products. 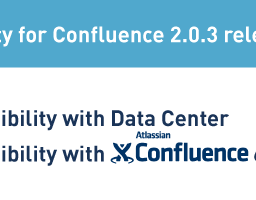 The goal of this newly established app program is to ensure a consistent experience for data center customers, with uptime and consistent performance at scale to mission-critical Atlassian applications. By using Data Center Approved Apps from the Marketplace, you can be confident that they have been tested under realistic circumstances, such as load testing, and approved to meet the high standards of Data Center customers. These are the first Data Center approved apps. More will follow. With this new category of apps, a new licensing and pricing model was also introduced – according to the Atlassian pricing model for Data Center. To help Data Center customers get started with the new approved apps, we have created a limited-time promotion for the transition phase (from September 2018 until the end of September 2019): Get a 50% discount on any new Data Center Approved app licenses! Accessiblity 2.0.3 – Real time collaboration is now barrier free!